$35,925 Our tester had a base price of $29,450 that included just about everything most people want as standard equipment, including full power accessories, downhill brake control and hill start assist control, alloy wheels, fog lights, electronic stability control with traction control, ABS, a vehicle stability management system, driver selectable steering modes, and Hyundai's nifty Blue Link Telematics system. The option list was a long one for our test car, including leather and premium equipment package that included leather seats, sliding and reclining second row seats with cargo area releases, heated rear seats, a technology package that had the panoramic sunroof, a navigation system with an eight inch touch screen and a heated steering wheel--a rarity on cars in this particular class of SUV/crossover. The final price of our Santa Fe Sport was $35,925. The Santa Fe Sport with its 2.4 liter engine and All Wheel Drive has good overall power, nice acceleration and the handling is agile, though not cutting. Power came from a 2.0 liter turbocharged 264 horsepower four cylinder engine. 19 city and 24 mpg/highway The Santa Fe Sport gets 19/24 miles per gallon and 21 miles per gallon in combined driving. The U.S. government estimated that owners of the Santa Fe Sport will pay $1,150 more in fuel costs over the next five years than would be spent on competing models. The annual fuel cost is $2,250 based on 15,000 miles of driving annually on gasoline that costs $3.55 per gallon. Very nice, Hyundai-esque design for a five seater SUV. This roomy vehicle has roomy trunk space with the catch net to keep cargo intact. Panoramic moon roof for all eyes and ears to appreciate. Leather interior seating. Driver gets lots of adjustability for a true, customized feel. Rear heated seats that fold easily and flush when requiring additional trunk room. Pretty cool car overall. It does what is expected well, and it looks like it?s a class or two more expensive than it actually is. Styling aside, the Santa Fe Sport was only the latest evidence of one of Hyundai's long term strong suits: Value. There were some features like standard hill descent control and optional full length panorama glass moon roof that stretches the complete length of the car that you can't even get on some very expensive SUVs and crossovers. Strong scores from the Insurance institute for Highway Safety. Driver Air Bag, Passenger Air Bag Side and Rear Head Air Bag, Rear Head Air Bag, ABS, Brake Assist, Electronic Stability Control, Traction Control. All the usual bells and whistles: Traction control, Stability control, lots of airbags, downhill brake control (not offered on many of its competitors), and on and on. Blue Link Assurance: Automatic Collision Notification (ACN) and Assistance, SOS Emergency Assistance, Enhanced Roadside Assistance. Blue Link Essentials: Remote Door Lock/Unlock, Remote Horn and Lights, Panic Notification, Remote Engine Start, Alarm Notification, Quick Tips, Location Sharing, Voice Text Messaging, Automated Diagnostic Trouble Code, Maintenance Alert, Recall Advisor, Web Vehicle Diagnostics, Service Link, Stolen Vehicle Recovery, Stolen Vehicle Slowdown, Vehicle Immobilization, Valet Alert, Geofence, Speed Alert and Curfew Alert. Blue Link Guidance: Turn-by-Turn Navigation, POI Search by advanced voice recognition system, POI Web Search and Download, Daily Route Guidance with Traffic Condition, Traffic, Gas Station Locations/Gas Prices, Eco-Coach Restaurant Ratings, Weather. It's clearly the Blue Link system that's the star of the equipment list. 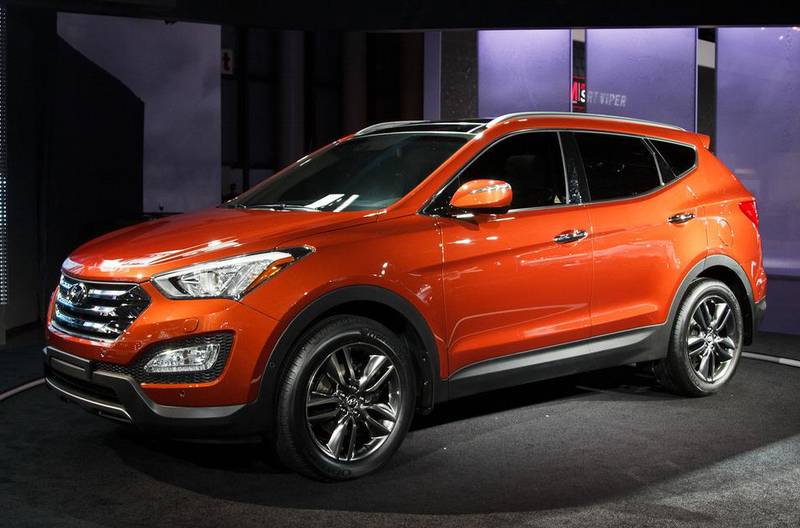 Hyundai includes it free for a 90 day trial, and given the ease of using it and its comprehensiveness, it will likely draw a large number of buyers just in and of itself, never mind the other compelling reasons to consider Santa Fe Sport. Blue Link "combines safety, service and infotainment features to simplify owners? lives and reduce distracted driving. Blue Link brings seamless connectivity directly into the car with technology like voice text messaging, POI web search download, turn-by-turn navigation, and monthly vehicle reporting. Hyundai Blue Link telematics is standard on all Santa Fe models with up to a one-year complimentary trial period. Blue Link can be easily accessed from the buttons on the rearview mirror, the web and via a smart phone. Blue Link is offered in three packages: Assurance, Essentials and Guidance." Here's what Blue Link offers depending on which package or packages you get: Blue Link Assurance package: Automatic Collision Notification (ACN) and Assistance, SOS Emergency Assistance, Enhanced Roadside Assistance. Blue Link Essentials package: Remote Door Lock/Unlock, Remote Horn and Lights, Panic Notification, Remote Engine Start, Alarm Notification, Quick Tips, Location Sharing, Voice Text Messaging, Automated Diagnostic Trouble Code, Maintenance Alert, Recall Advisor, Web Vehicle Diagnostics, Service Link, Stolen Vehicle Recovery, Stolen Vehicle Slowdown, Vehicle Immobilization, Valet Alert, Geofence, Speed Alert and Curfew Alert. Blue Link Guidance package: Turn-by-Turn Navigation, POI Search by advanced voice recognition system, POI Web Search and Download, Daily Route Guidance with Traffic Condition, Traffic, Gas Station Locations/Gas Prices, Eco-Coach Restaurant Ratings, Weather. Great looks, contoured and dashing styling like you would expect from Hyundai-brining all of its products toe-to-toe with brands that weigh-in at a higher dollar amounts. Dash is designed well, though there are an awful lot of touch points, many with starring access. The vehicle comes in a total of four (4) trim levels. As mentioned earlier, it's up to date and expensive looking. Nothing to be ashamed of, that's for sure. 10 year / 100,000 mile power train warranty Ten years and 100,000 mile warranty are just the beginning. Lots of other warranties, too.